I’m moving this weekend, which means that I’ve been spending a lot of time at hardware and home decor stores. While I am so excited to decorate my new space, I am also becoming more and more aware that the cutest items often cost a pretty penny. I’m realizing that it’s important to cut corners and save money where I can, so I’ve been looking for new and unexpected DIY ideas to spruce up my new apartment. One trend I’m noticing is upcycled lampshades – crafters are taking old, plain store-bought shades and adding fabric, rope and more. Some people are even getting rid of the lampshade entirely and creating their own lighting from unexpected items like wire and paper plate holders. 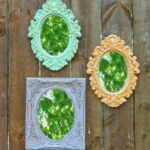 Either way, these projects are a creative, innovative and inexpensive DIY option! 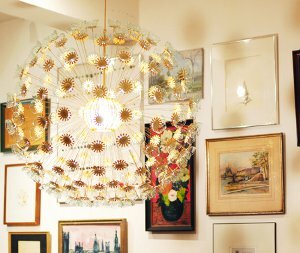 There are so many ways to upcycle a lampshade and create a stylish home decor piece on the cheap. If you love the look of tie-dye (it’s a huge trend right now), you can create an Indigo Fabric Flower Lampshade. While you’re at it, be sure to cut out muslin flowers to stick on to the lampshade! Show off your colorful side and make a Scrap Ribbon Lampshade. This is a great excuse to dip into your supply stash and use up those old scraps. 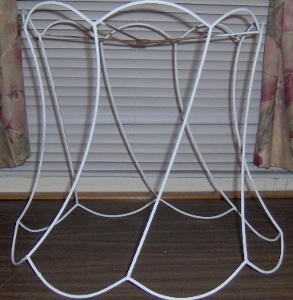 Another fun way to upcycle fabric is by creating a Casual T-Shirt Rosette Lampshade. The pretty florals add a cool and unexpected look and texture. 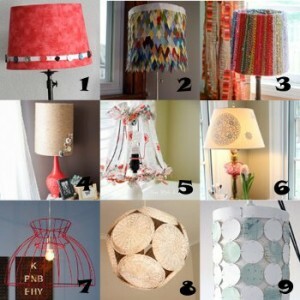 If you want to change the look of your space, stay at home and makeover a lampshade. You don’t have to drop a ton of money on supplies, either. As these home decor projects show, scraps, old t-shirts and paint can certainly come in handy. 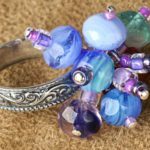 Get creative and experiment – you’re sure to love the results. I’ve always been hesitant to redecorate, mostly because I have no interest in spending money on window treatments or furniture when what I already have is more than functional. But there are plenty of budget-friendly ways to spruce up a room by doing a little sewing. 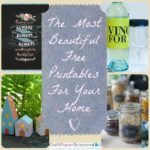 Check out these home decor ideas to see how you can redecorate to your heart’s content without depleting your life savings. 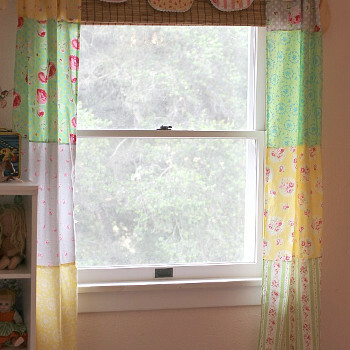 Young girls will absolutely love the pastels of these patchwork curtains. This easy sewing project will instantly brighten up any room, and it’s completely budget-friendly. Grab your leftover fat quarters and check out this sewing tutorial. 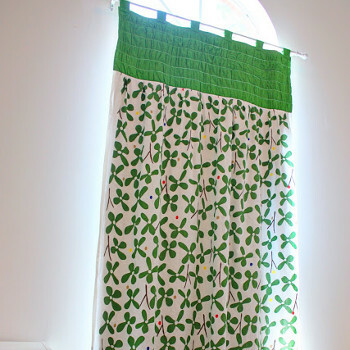 DIY curtains are a stylish and thrifty way to revamp the look of any room on a shoestring budget. A charming living room doesn’t have to come with a big price tag. When you sew DIY curtains, you put a personal touch on your home decor while saving a boatload of money. These Gathered Top Panel Curtains will give your home a delightful look for a fraction of the price of professional window treatments. 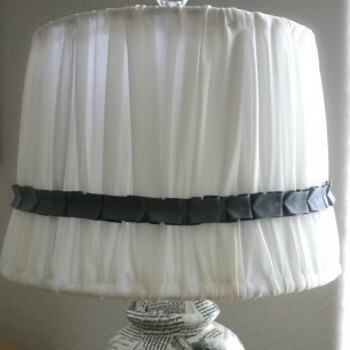 Ribbon and chiffon are the perfect combination to make your lamps look brand spanking new. 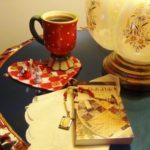 Look at this sewing tutorial to learn how you can refashion your lampshades for a nominal amount of money. 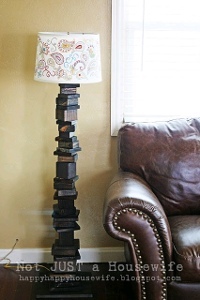 Easily refashion your plain and boring lampshades to give your living room that chic and stylish look you crave. Ideas for home decor like this make updating the look of a room a breeze. 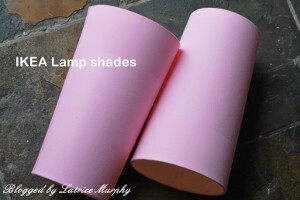 A new lampshade can be as inexpensive as $0.00 You don’t have to spend any money to make a DIY lampshade when you can refashion your plain, boring lampshade with an old skirt. 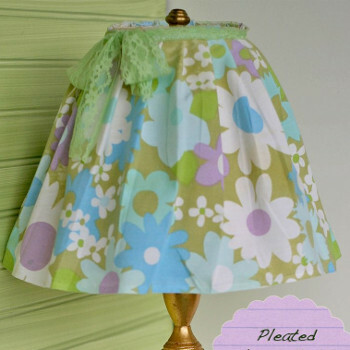 Grab a fun skirt you no longer wear and do a little sewing to make this stylish (almost) new lampshade. 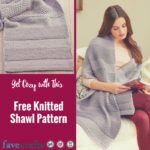 You’ll love how easy this thrifty home decor idea is to sew. Comfy seating for your living room is easy to make on a budget. Sew this DIY seating for less than $10. 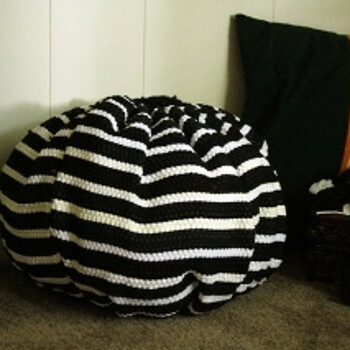 It’s easy to give a room a makeover just by adding a soft, bean-bag like chair. 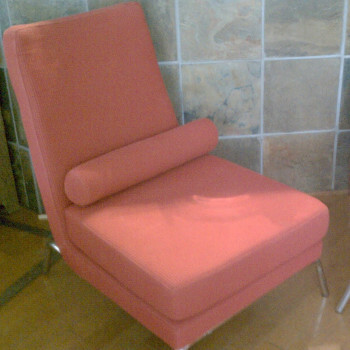 Kids will love to sit on this new seat while they watch TV, read, or do their homework. There’s no need to replace the seating in your living room just to create a new ambiance. Instead of buying a new chair or a cover from the store, sew your own by following this easy sewing tutorial. Home decor ideas like this let you update the appearance of a room without having to dip into your bank account. How do you give your home a makeover on a budget? This tutorial is brought to you by Latrice Murphy from Any Occasion. 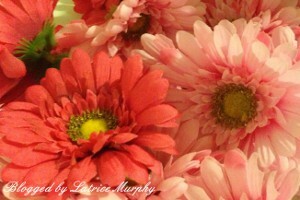 It’s finally spring here in Illinois and I’m excited to share the seasonal projects with you. My first craft idea was to dress up some lampshades that I’ve had for about six years. They were originally meant to be displayed in my daughter’s room, but we went in a different direction. Since IKEA has great prices, we decided to hold on to them until inspiration struck. My daughter and I get to visit American Girl a couple times a year and have either tea or lunch there. Well, our first time in the cafe, I was totally floored by the decor. They had these giant lampshades covered in hot pink and black flowers. STUNNING, I tell you. I turned to her and said “We’re going to make something like this.” So here we go! 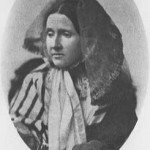 First off wipe down your lampshades with a damp cloth. Mine were a little dusty from being stored for a few years. 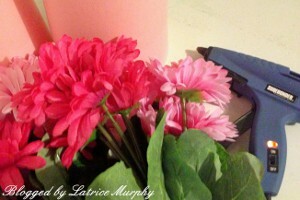 Next, move on to prepping your flowers. 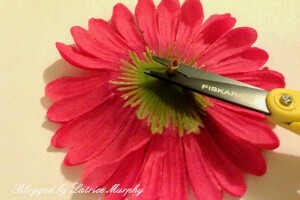 Pull each flower off the stem and snip the flower as flat as possible. This will make it easier when gluing them to the shade. 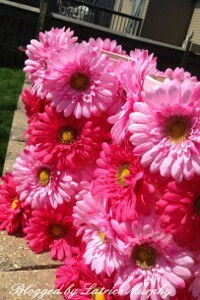 You’ll end up with a giant pile of flowers. All you do next is take your time adding about a quarter size of hot glue on the back of one flower at a time and holding it in place on the lampshade until it’s cooled enough to stay on its own. I did both shades this way and it took about an hour since you have to hold them for a few seconds. I ended up with a fun finished project. These will finally get hung in her room. I haven’t decided whether to light them or not since the flower and glue would get hot. We may go with an LED bulb so the heat wouldn’t be an issue. Happy spring wherever you are! 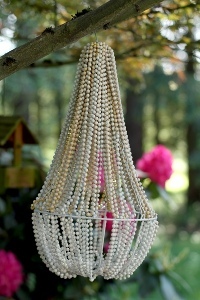 I have to admit, I’d never heard of a pendant light before I started blogging for FaveCrafts. Maybe I just haven’t spent enough time decorating my (non-existent) home. Or perhaps pendant lights are just the latest craze in the craft world. I love talking about craft trends on this blog, like embroidery hoop crafts, specimen art, and burlap, so I figured I’d cover pendant lights too. I put together a list of 15 DIY Pendant Lights, and you should check it out to see the different lamps, chandeliers, and light fixtures I found. Here’s the truncated list of my favorites. 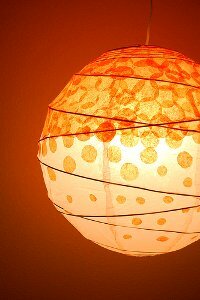 I also love this Polka Dot Tissue Lantern. It’s another simple project that will only cost a couple bucks to complete. And the impact is amazing! I’d like to make a bunch and group them together to inject an extra dose of style. Last but not least, we have the Scrap Wood Lamp. I’m not that into wood accents, but this lamp is an exception. My favorite part is that all the wood pieces are just scraps from other projects. My other favorite part is that the tutorial makes using power tools look easy! Yes, even you can use power tools and wire a lamp with this tutorial. It’s amazing. Read the entire article here to see all 15 DIY Pendant Lights. And now here are a few cool DIY pendant lights I found around the web. 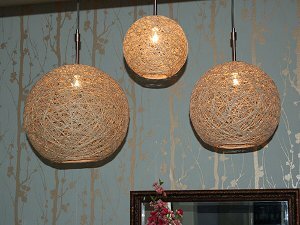 These hemp pendant lights are similar to my glue yarn ball tutorial I recently posted. You can see some additional tips and tricks for getting them to look great as giant pendant lights here. 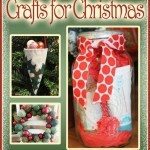 You know how much I love coffee filter crafts! This pendant light is covered in them–literally. It sounds like this light took forever to make, but it looks like it was definitely worth the effort! Just look at how gorgeous it looks over the table! I also love the drama of such a large, in-your-face light fixture. See more cool pendant lights to make in my article, 15 DIY Pendant Lights. Have you ever made a pendant light? How did you make it? Which one of these projects is your favorite? Every now and then, everyone could use a helping hand. Ready to lend your assistance? Below you’ll find a few readers in need. If you feel you can help or have any suggestions, please post your answer in the comments. Please try to supply instructions and/or links. 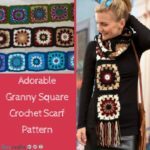 I was offered to teach a 2 hour crochet for beginners class once a week, but I don’t know how to start it. Any suggestions on how to break the ice? By the way, I’m 35 years old and the majority of my students are older, Spanish speaking, and they think they know it all! That intimidates me a little!